Two years ago, the Philadelphia 76ers won 10 out of 82 basketball games and were widely considered to be the worst pro basketball team in history. It was all set up a few years earlier by a mediocre season when the team decided to, well, stop trying. Under new leadership, Philadelphia stripped their roster and intentionally sucked four years in a row. Turns out, they were just playing a different game than everybody else. The Sixers branded their bold long-term strategy under one simple phrase. Today, #TTP has begun to infiltrate all aspects of society. Chances are you’ve already heard it from a teacher, mentor, or friend. Now, the Sixers are looking like a serious contender in the NBA playoffs, with a plethora of young talent and more draft picks coming. How did trusting the process work, and how can college student organizations do it? Understand how to work around one year terms: Stop me if you’ve heard this one before… excited college leader begins their term with a different goal than their previous leader, but ends up hitting similar roadblocks and burning out only for a new person to keep the cycle going. This has always been the case with NBA teams, with common annual struggles including striking out on draft picks, key players leaving through free agency, or overall lack of identity. The Sixers needed to adapt a strategy that would last several terms so future leaders would buy in and keep it going. Does your chapter have such a mantra? Embrace the criticism: During the early stages of #TrustTheProcess, tons of people gave the Sixers heat. Many “experts” said they were infecting their whole organization with a culture of losing, which inspired the mantra in the first place. But the Sixers politely laughed back. They slashed ticket prices, made game days fun, and brought back the catchiest team song of all time. They sold fans on going to games to see growth, have fun, and not care much about the results-oriented metric of success (the scoreboard). Fraternity & sororities have metrics of success, as evidenced by the pressure to dominate unofficial rankings while “not trying too hard.” Many groups struggle with that belief conflicting with a desire to be different, which usually leads to an inability to do either well. The Sixers proved different can be fun, how are we helping students prove it, too? The right advisor: While the process has caused frequent changes in their roster, the Sixers chose a coach carefully beforehand knowing he’d be there for the long haul. Bret Brown was from a championship team, willing to commit to several years of “losing” to achieve long-term goals, and (most importantly) expected to build a trusting mentorship with his players. Too many chapters we see do not have a great relationship with their advisor, or do not know what they should be looking for. These same students who make their own daily choices for success in the classroom often don’t with their most pivotal extracurricular opportunity. How can the advisor format be adapted where undergraduates are more inspired to select, develop and enjoy working with their advisors (especially volunteers)? Don’t Ditch the Seniors: In college life and sports, culture issues are inspired by lazy veterans. That doesn’t mean they’re not important to success. The Sixers shed plenty of old players, but always brought back a few new ones who had seen playoff success and were willing to mentor younger players. Most chapters complain about their seniors as a whole, without taking the time to recognize the good ones and find ways to get them more involved. The bars are fun, but memorable conversations with like-minded people will always be a superior product. How is your chapter giving your best seniors a more compelling product than the bar? Invest in something. Anything. Too many fraternity & sorority communities are sitting around right now with too many options of things to invest their time and resources in. I can sort of see why, with all the pressure from different directions and and motives. But there are too many quality volunteers, outside experts, and potentially amazing members out there who are not utilized. Investments don’t always have to be expensive, but they have to be made. The Sixers found most investments through the draft (recruitment) while putting the bulk of their financial investment in a long-term coach (relationships & development). Are you investing in your own recruitment & new member development? Here’s some free stuff to get started. Steadfast Commitment: A couple years into the Sixers intentional failure, experts began admitting something interesting: there was almost no way for it to not work (unless they panicked and stopped). Teams mess up on top 5 picks every year in the draft, but they had never got them this many years in a row. Even with an element of luck involved, it was getting to a point where the Sixers didn’t even need luck. Their #1 overall pick missed most of this season, and they didn’t even need much from him. When the pond is stocked enough, a little time is all you need to catch fish. If we love talking about how big our problems are, why are we unwilling to commit to most long-term solutions? Why are we so obsessed with “quick fixes”? We live in a results-focused society, which makes the art of the process that much more critical. Every organization should be seeking to incorporate #TrustTheProcess right now, and it needs to be through a digestible mantra just like the Sixers did. Ultimately, the definition of digestible is up to the active members. What is your organization’s mantra? How are you trusting the process? Here’s how Phired Up is transforming fraternity through Get Off The Stage. “Get off the stage!” That might be our team’s new mantra. Nobody’s heckling us. Quite the opposite. We’re yelling it at ourselves. Let me explain. This semester our fraternity educators have been engaged in critical discussions with fraternity men around the country. We’re learning a TON from them. These guys are begging for legitimate help, but are rightfully wary of shiny, polished, canned speakers. And these guys understand the complexity of their situation. They get the interplay of policy, member education, risk management, recruitment, marketing, and leadership. Fraternity men are smart. There was a time when fraternity/sorority pros would bemoan fraternity men. If you’re doing that right now, you’re not listening. These guys are bright, driven, and suspicious of bullsh*t.
Here’s what we’ve been doing that is proving very effective. 1.Remove the blame: What we ask of our fraternity leaders really is unfair. “Here’s 150+ years worth of problems we’ve created, and here’s literally the worst reputation problem in our history. Fix it and don’t screw up.” We are finding ways to demonstrate that we are an adult you can trust, and we are focused on your actual priorities (which by the way, are actually more similar to the university and HQ than many may think). 2. Connect the dots: We’re blending messages about recruitment, new member education, marketing, health & safety, and risk management together because these guys are smart enough to understand the connections. And they’re loving it. Telling them to manage risk or not to haze sounds so cliche to them. Even telling them to recruit with values sounds kind of stupid and irrelevant. 3. Provide long-term support: We’re not trying to solve giant problems in a day. We are building trust-filled relationships and offering long-term access and support. These guys are really interested in long-term conversations as a way to leave a legacy of smart leadership, as long as we’re addressing their immediate real-life needs and priorities too. 4. Get off the stage: We’re bringing our education down to ground level with personalized chapter consultations that allow each chapter to build their own curriculum. Our conversations are far more inclusive and discussion-oriented than they’ve ever been. We’re respecting the savvy of these men and learning along with them. They are contributing valuable ideas so long as we don’t put the onus entirely on their shoulders. We’re still really good “on the stage” too (in our humble opinion), but we can’t stay there. We have to sit down next to these fraternity men and work with them in practical ways. The University of Illinois is one of largest IFC communities in the country. Earlier this week Andy Bremer and Matt Mattson spent a combined 14 hours on campus meeting with individual chapters (an intense day! ), providing customized chapter coaching sessions, and bringing the education to the immediate needs of each individual chapter. On the exact same day, Austin Netherton from the Phired Up team was delivering on-site support to the entire University of Iowa IFC community. His work facilitated a complex discussion that included masculinity, university policy, recruitment tactics, and simply demonstrating an understanding and care for the emotional rollercoaster of being a fraternity leader and a collegiate man. Texas State is another campus that recently requested an intense day full of individual chapter consultations for each fraternity there. Phired Up worked with the biggest and “coolest” groups, as well as the smaller, newer, and more specialized groups. The goal was to respect the individual identity and goals of each chapter, and honor who they wanted to become — which by the way was always a fraternity of excellence. These rules are transforming the way we’ve been able to help fraternities this semester. We believe the “pre-member” experience is the area with most potential for long-term impact on the overall health and safety of fraternity & sorority chapters. Most interventions related to risk management, alcohol/drugs, sexual assault, and hazing (the biggest fraternal problems) are aimed at current members, when so much of the idea of “fraternity” is established well before a member is initiated. We are pre-membership experts, and we want to make sure that all the men that are initiated into fraternities are the right men, with the right expectations, and the right preparation. We want to create a healthier buyer-pool to create healthier fraternities. But in order to do this, we need to be on the side of the IFC men we’re working with. Our team has been working hard to critically re-imagine our approach to fraternity education, and it’s working. It’s been a long-time since we’ve had this much demand for fraternity education. Hopefully those four rules will be helpful for you: Remove the blame. Connect the dots. Provide long-term support. Get off the stage. Read more here, here, here, here, here, here, and here about how we’ve been connecting with fraternity men this year. Contact us to book our Phired Up education team to work with your fraternities. We are available to solve big problems, help fraternity grow in the right way, and care about the men leading your fraternity chapters. March Madness is fun because it’s unpredictable. The last few weeks brought wild upsets, a 98-year-old nun becoming a household name (what up Sister Jean? ), and some clueless basketball person you know probably outsmarting the annoying “expert” in your bracket pool. Yet, Villanova lifting the trophy was perhaps the most predictable thing in a tournament filled with wackiness. The win was Villanova’s 165th in the last 186 games, capping off a 5 year run where they won 88% of their games and 2 national titles. Experts are calling it the most dominant run in the modern era of college basketball. A strong new member process cancels out membership turnover. Fraternities like to make excuses that their leadership turns over every year, and members cycle out every four. Yet, Villanova’s current run has endured the same factors, plus they have the same type of members: competitive, (typically) 18-22 year old college students with only 1 constant figure–their advisor. For Villanova, the process is all built around coach Jay Wright and his ability to convey team culture to new members. It’s only fitting that he is a fraternity man himself, joining Sigma Chi while at Bucknell. Let’s dive deeper into how he has built one of the best member onboarding systems of any college student organization. Onboarding is about building up, not weeding out: Considering roster limits and the abundance of great high school players, most college coaches seek to recruit more players than they need, and make sure those who “don’t cut it” ride the bench or transfer. So it’s unusual that Wright intentionally leaves a couple roster spots empty every year. Simply put, his weeding out happens during recruitment, and those that sign with Villanova are given every opportunity to get on the court. He knows there will be critics either way, and believes this method is the most fair to members of his team. “I want it to work when a kid is here,” says a former assistant on Wright’s philosophy. Think about this the next time a fraternity member tries justifying how many new members they drop. Embrace continuous member development: While every path is slightly different, a typical Villanova player spends most of his freshman year learning and growing with his teammates, sophomore year emerging as a leader, and upperclassmen years as somewhere between a national award candidate and active mentor to young players. Some of Villanova’s top competition has sought out “one and done” players, who are more talented but already know they are a year away from leaving. This actively mirrors fraternities who see new members as done developing by the end of the pledge process. Villanova’s constant combination of talent and experience is essential towards team goals, as well as individual development. It’s why the program has been a factory of success while their peers often fluctuate based on talent coming in and out. His former assistant, Billy Lange, described the shift Wright had to make so he could still attract great players, but avoid ones in it for themselves: “I want guys that want to play for Villanova and be part of this program. I’m going to message everything I do the same way. 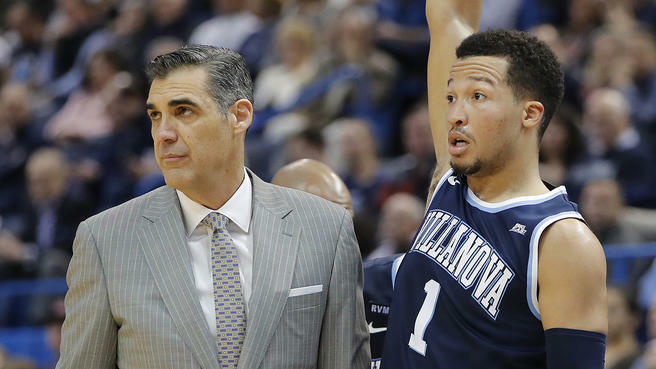 If they don’t want to come, that’s fine.” During Villanova’s current run, they have not had a top 20 recruiting class in 247sports’ recruiting rankings. Treasure your seniors & alumni: There’s a sign on Wright’s door that says “play for those who came before us,” and he holds an annual summer gathering so alumni and their families can form relationships with new players coming in. The bond is very much echoed in the players. Before Villanova’s hot run of success, they were considered chokers and lost in the first weekend of the tournament two years in a row. Current players have praised the seniors on those losing teams for encouraging them to stand tall through adversity, and that forged their path to the top. Yet, most fraternities have trouble getting seniors to even show up once a week? Onboarding is about your new members, not you: Most organizations with Villanova’s success use their facilities to showcase it, and display banners or trophies for all new members to see. So, people are usually surprised when they learn the walls of Villanova’s practice facility are strikingly bare, with only the word “Attitude” displayed behind each basket. I don’t see this as a knock on groups who advertise success, but rather a reminder that new members of a successful team can feel a lot of pressure. Wright is clearly doing everything he can to make sure his new members create their own experience, and knows past success speaks for itself. Are there ways we let our history overly influence our new members’ creativity? Beware of outside attention, and focus on improvement: “All the attention, it’s really scary because it’s intoxicating,” Wright told GQ after his first title in 2016. He noticed that the level of praise they were receiving hurt their ability to do things the right way. Wright began focusing less on calling specific plays, and more on the mental side of the game. When Villanova players make a big shot, they still get pumped up–but Wright instructs them to deliver that emotional energy to their teammates instead of everyone watching. “Players play for their teammates and coaches; actors play for the crowd” is another Villanova slogan. Does your chapter care more about the perception of your new member program from outsiders on campus, or how to strengthen your relationships from the inside? Enjoy who you’re winning with more than winning: The final secret to how Villanova wins so much? They don’t really like to talk about it. Seriously, YouTube any Jay Wright interview and it will shock you. He doesn’t even take the bait when reporters insert winning into the conversation. After steamrolling one of the top teams in the country Saturday, Wright was asked about it and said his players want “a community off the court, and they feel like it will make them the best they can be individually as a student, as hopefully a pro player, and they really want to enjoy that experience of community.” Players echoed the sentiment, seemingly more excited about seeing how close they could get to their potential than what the scoreboard said. Then, they played even better and won the title. Star player Jalen Brunson said it perfectly when asked why the championship made him so emotional… “It’s so special when you have a relationship with these guys, it’s something we’ll remember forever.” By the way, Brunson had one of his lowest scoring games, sat on the bench most of the second half, and smiled the whole time while one of his mentees took over the game. Let’s make that a quote we build our success around, too.